The weather is just right for hot chocolate and if you are looking for a Halloween gift for your neighbors these cute Halloween hot chocolate spoons are a fun choice. The kids can help with the dipping and even make a simple version with colorful sprinkles while you make the fun spiderwebs, jack-o-lanterns, ghosts, and Frankenstein spoons. 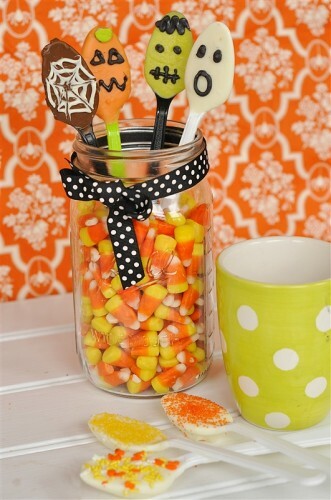 You can see the Halloween hot chocolate spoon tutorial over at Your Homebased Mom.